Ovi was Nokia’s aces, trumphs and everything put together. 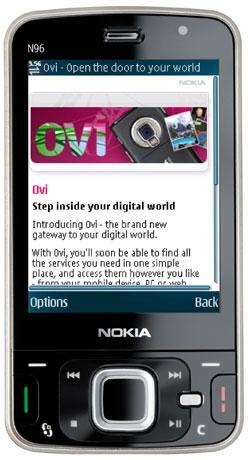 Ovi which means “Doors” in Finish was an ambitious plan to open the doors of branded Nokia services to the Nokia users. Unfortunately that never happened. Nokia has now announced that it will phase out the Ovi brand eventually by 2012 in favour of a single Nokia brand, Nokia services. The transition begins with new devices being launched this July, August. Although Nokia has not specified which countries will see the rebranding first, it is expected that North American and European markets will see the new Nokia brand first, completing across all countries and services by the end of 2012. The services roadmap continue unaltered. This is one of a long list of changes for Nokia and an admission that the Ovi brand never really worked ever since 2007 when it launched the Ovi brand. As of April 2011 there were exactly 5.0 million downloads every day, also 158 developers reached over 1 million downloads for their Applications. This is the first bold move by CMO Jerri DeVard and an admission of the fact that Ovi brand has failed. This also marks a clear shift in Nokia’s strategy and puts focus on Nokia brand, reducing consumer confusion as Microsoft partnership grows. This transition is expected to last into 2012 and was pretty much inevitable in the wake of Nokia’s hookup with Microsoft earlier this year. Part of that agreement was for Nokia software, Maps in particular, to be made available in other Windows Phone devices and across Microsoft’s range of services, so it makes sense for Nokia to literally put its name on its wares. The timeline of Ovi with key events around it. X3: Nokia’s mid tier Silver Bullet? Nokia’s efforts to come up with “Game Changers” and “iPhone Challengers” have been a study in what-not-to-do in the device-consumer space. The N97, The N900 and now the N8* have not been upto the mark to challenge the rapid strides made by iPhone and Android in the last 2 years. (*: I had done an hour with the N8 and its touch interface was seriously a few miles behind the Moto Milestone/Droid Interface). Having lost a considerable room at the top, Nokia is getting more and more aggressive at defending its position if strength: The Mid End. With that in mind (it seems), Nokia has now announced the X3, a series 40 device, which is a combination of a resistive touch and unusual key pad, 5MP Camera, 3G and WiFi. It is powered by a ARM processor that can do a 400 MHz to 600 MHz processing. It comes bundled with email, Social networking, Ovi Music and is seemingly handicapped by absence of GPS and Flash. It definitely looks neat and slim at 9.6mm. Nokia’s introduction of touch screen control to series 40 devices mirrors its approach with S60. The thought on combining the context key (Hot keys) and navi-key interactions as touch controls don’t cut ice with the high end Multimedia devices and smartphones. The S60 marriage with the Context-key and Navi Key touch controls and its resulting tacky performance was one of the key reasons for Nokia’s slide in the smartphone segment. The decision to implement touch support to Series 40 was overdue, given moves by competitors in the mid end. Touch(= Context key + Navi Key) may be a first “touch” experience for many million consumers in the developing nations in Afro-Asia. This is mass that Nokia is looking to cater to with this device, but then the white Box Chinese manufacturers are already planning Full touch devices for this segment. These are the low cost Android phones that Huawei is talking about. If Huawei were to get its act right, then it would mean that it would be a few steps ahead of Nokia in terms of taking the “Touch” to the consumer. Also Companies like LG and Samsung are in their fourth generation, giving them the stability and maturity that can come with the iterative design processes. Nokia’s resistive screens and “Touch” experience may be ill-equipped to take the pressure from the mounting competition. Bottomline: Nokia needs S40 Full touch (and QWERTY) devices to protect its market share in its traditional mid-tier stronghold. The X3 is not exactly the best start, but it heralds Nokia moving into Touch devices for the mid tier Seris 40. One can only Hope that Nokia’s next in roadmap devices are better than the X3 in terms of Touch experience. Nokia desperately needs to hold onto to its mid tier market shares and can ill-afford to lose these segments, given its already weakened position in high end segments. Nokia is feeling the heat all over. It now has closed down in North American stores in Chicago and New York and one of its two London stores across the pond. It is also shifting its Sao Paolo store in Brazil. Not only in its brick and mortar form, but also with its online Ovi store, Nokia seems to have hit a breaker. Nokia’s case is quite paradoxical to Apple which has tasted success in both forms of the stores: Online as well as Brick and Mortar. A beleagured Nokia faces competition from RIM, Apple, Palm, Moto and Samsung in the Smartphone space; is threatened by OEM imports in emergingmarkets and its software services platform never really took off. Once a stock market darling, Nokia’s shares have fallen 20% since September even as the broader market has rallied. 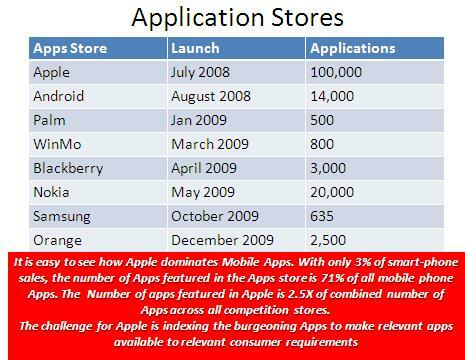 Nokia launched the Ovi Store in May/June 2009 clearly challenge the Apple Dominance on Apps. However 5 months after an otherwise lukewarm launch, Ovi has stats on its side, but these pale infront of the Apple Juggernaut. •	Ovi Mail has more than 3 million subscribers, and carriers like the push email because it boosts data usage. Nokia has signed over 20 partners for a carrier version of Ovi Mail. •	Downloads of apps on the Ovi Store are growing 70 percent per month, and every registered Ovi user has downloaded eight apps on average. 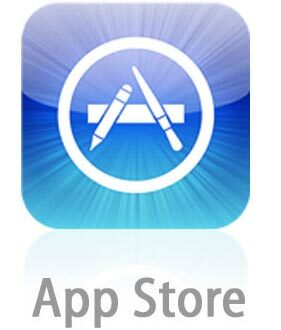 •	The number of users downloading apps is going up 50 percent every month. •	The Ovi suite – which also includes music and mapping services – now has 80m active users, up from 54m in August. George Linardos, head of products at Nokia’s media group, said on 8th December 2009 that Ovi Store had been outpaced by Apple after complaints on stability and reliability. He also admitted that the chorus of complaints from end-users were driving the next version, noting that his company has “screens up in [their] offices running Twitter feeds [of gripes] all day long.” In fact, he likened the act to “sitting there and getting punched in the face.” So while the first coming of Ovi was beaten comprehensively unable to compete with the Apple Apps store, a second coming of Ovi has been planned in Spring 2010. New features will include in-application payments, a redesigned user interface that makes apps easier to discover, and faster operation. Longer-term, Ovi Store will include recommendations based on friends’ app purchases and more localised content. In its second coming, the company wants to localize the Ovi Store for 20 countries by the end of the first quarter of 2010. Localization can mean instant success. In India, for example, Nokia’s music download service is becoming popular mostly because many people don’t have PCs and are using their phones to download music. Similar trends are being observed in Brazil and Mexico. Nokia believes the success of its Ovi Store and services is going to come from its traditional strongholds: Europe, Latin America and Asia. Ovi’s big opportunity is overseas — outside of the U.S. However, while US is not on the focus geographies list, it is also important for Nokia to maintain a mind share in US so that they are abreast of the best apps and platforms and are exposed to the most advanced development eco-system globally. On Ovi, Nokia need’s to get all their ducks lined up, including hardware, software and services. At the moment, none of those are working properly. One hopes that Ovi gets it right this time because second chances are rare, and there are no third chances. As the App Store has matured, so has the need to come up with more sophisticated ways to profit from it. Simply having a great application is not enough. The App Store’s success — as much a surprise to Apple as it has been to competitors — has given rise to a new digital ecosystem. Today, hundreds of software aspirants, from individuals tinkering in their bedrooms late at night to established companies looking for lucrative new revenue streams, are jumping into the App Store fray.And smart-phone manufacturers across the board are trying to make their platforms more attractive and lucrative to bring in the kind of creativity and enthusiasm that Apple has. It’s easy to see why: Analysts estimate that Apps store generates as much as a billion dollars a year in revenue for Apple and its developers. However the question increasingly being asked by analysts world-over is “Is it about 20,000 apps or 200,000 apps or is it about changing those 20,000 apps and their deep integration and how they interrelate to one another?” With Apple adding the numbers up briskly, the view about Apps is now beginning to shift. Palm and Research in Motion, say they don’t need an avalanche of applications to compete. It is much more interesting to change the applications and changing the user experience and really unlocking the promise and the money and revenue opportunity for the ecosystem. Thus the story is changing from too many apps to a limited number of meaningful apps: Apps which integrate into the user’s activities and lives and are used as a necessity. Most phones will end up being smart-phones. There will be more services and new ways to monetize and more consumption. Growth is a given; it’s just a question of who is going to innovate in the right way to drive that value proposition to capture that growth. Microsoft, which analysts have criticized for its sluggish approach to the smartphone market, also says it is emphasizing quality for the application store it introduced in October, Windows Marketplace for Mobile.“Our strategy is to look holistically at how we can provide the best all-around user experience,” says Victoria Grady, director of mobile strategy at Microsoft. The Marketplace now has more than 800 apps. Many developers and analysts think Google’s mobile operating system, most recently placed in the Motorola Droid, may evolve into the fiercest competitor to the iPhone. Android unique applications are no longer limited to a single device. The growing number of Android-powered phones available on multiple wireless carriers increases the financial opportunity for developers. An year back, Android just had 1 handset which has now increase to close to dozen. Android volumes are going up at a tremendous pace, and the developer ecosystem is seeing that. Unlike Apple, Google has eschewed a review process, allowing any developer to publish an application to the Android Marketplace, its version of the App Store, instantly. About 14,000 applications are available for Android-powered smartphones. Apple has another strong advantage: the iPhone offers developers a uniform, standard platform. When, a developer creates an application for the iPhone, he knows how it’s going to run exactly as you tested it on every single model. The same isn’t true for the rest of the smartphones, which have varying screen sizes, processor speeds and form factors. HOWEVER the competitive landscape shapes up, the App Store phenomenon shows no signs of slowing. IDC, a technology research firm, predicts that the number of iPhone apps will triple next year, fueled by the growing popularity of smartphones and other mobile devices. Along the way, analysts say, the App Store will continue to upend the architecture of the smartphone business and threaten competitors that don’t have vibrant and extensive offerings. This changes the way the smartphone industry operates. Each handset company would come up with its latest iterations and maybe have the hottest device of the season or not. With apps in the equation, all that changes. It goes from being a product cycle game to a platform game. Barely 15 day s after i had written about Nokia’s dual OS strategy, It turns out that Maemo is not so big news from Nokia. Nokia has gone through a rough patch over the last 18 months or so. It has lost heavily in the smartphone space to Apple, RIM and Google; and its overall numbers tumbled down in 2009. Ovi store was a lukewarm fare. However, it seemed to be making a comeback of sorts with interesting applications such as Nokia Money and Lifetools in the Mid end and Maemo devices in the smartphone segment. N900 got a great response as Nokia moved away from the Symbian platform for the first time after failure with its N97.N900 boasts some impressive specs for a smartphone-type device, and includes a touch screen, QWERTY keyboard, media playback and more. While the N900 is a bit of a niche play and doesn’t have the largest addressable market, it’s an important step for Nokia to take in regaining some much-needed momentum in the world market for smartphones. 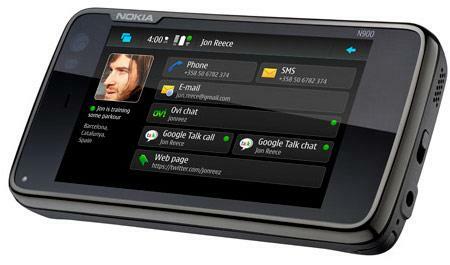 The N900 was thought to be not only the Nokia flagship, but also a learning platform for Nokia and its Maemo line up. In this regard, Nokia’s decision to launch only one Maemo based device in 2010 is bewildering. Nokia is committed to the Symbian platform as its “smartphone platform of choice”. Symbian S60 — is outdated and clunky. Maemo looked to be a solid step in the right direction, at least from a usability standpoint.The one Maemo-device announcement was thus a let down, dashing hopes of a slew of high-end, Linux-based phones from the mobile manufacturer.The Symbian Foundation has been working hard to reboot Symbian as a platform, but so far developments has been slow, and no devices have been announced with support for the latest Symbian versions. Either Nokia plans to take over the world with just a handset update per year like Apple does or it believes Symbian still has some life left and will continue churning out S60 and the upcoming Symbian Foundation OS based phones by the dozen. The only manufacturer for whom this “one device a year strategy” has worked very well is Apple. 2010 would be a busy smartphone year with the supposed Apple 3.1 being readied for release and Android getting mainstream. Putting a large bet on Symbian S60 can significantly risk the Nokia portfolio. There is an opinion that even one Maemo phone would be enough – if it’s an iPhone killer. To flip it around, if Nokia’s 2010 Maemo and Symbian devices return average results, they would get dangerously sidelined in the smartphone space. That would also mean being left out of the consideration space of the developer community. That’s a bad idea, Nokia. Nokia’s acquisition of Dopplr: Whither business sense? Nokia has been on an acquisition spree lately. Celity, Bit-Side, Plum and now Dopplr. One hear’s about the acquisition of Palm a well. That’s been on air for some-time now and we still don’t seem to have any definite answer on that. The purchase price is said to be between €10 million and €15 million. The site has never grown to huge usage, but its core users are passionate about Dopplr. This is in contrast to Tripit, which has a larger audience and caters to the same socialize-while-you-travel idea. The problem with this idea seems to be that, it belonged as part of something bigger, not as a standalone site. There is too much social capital that is required for yet another “community” website. One single purpose did not warrant another log on, another bit of data input. The idea was nicely executed, however, but not compelling enough on its own. The flip of this is that Dopplr may add up to Nokia’s world well and would get the threshold volume it always lagged. Interestingly, in 2008, Nokia purchased Plazes – another location-based service with social networking roots. Plazes offers users the opportunity to share locations and activities with friends while geotagging the sites they like. Dopplr serves a similar purpose; however, friends are meant to meet up while traveling. If this sounds familiar it’s because services like Foursquare and most recently Gowalla have gotten iPhone users into the habit of checking in and leaving tips at their favorite haunts and watering holes. With Plazes in 2008 and Dopplr in 2009, both serving the same purpose, I wonder how Nokia has visioned its advance in Travel social networking. Admittedly, it does seem to have little of any worth in two acquisitions of same nature without doing much on the first one. Over the last year and half, Nokia Scrip price has yo-yo’ed from $ 40 to $ 8 given the slump in the market and demand, its own performance in the smartphone market and its decision to change tacks from device orientedness to internet services focussed approach. Yesterday Nokia declared its 1Q, 2009 results and though a drop in numbers was in line of expectations, a 90% drop in profits was beyond expectations. This was Nokia’s worst quarterly profit in more than a decade. Profits declined to 122 million euros (US$160.7 million), from 1.2 billion euros (US$1.6 billion) a year earlier. Sales fell 27 percent. Nokia sold 93 million phones in the first quarter, 3 million more than analysts had anticipated, the ASP of the phones fell sharply to $85 from $93 in the fourth quarter. Nokia’s Devices & Services unit saw net sales decline 33 percent year-on-year to 6.2 billion euros (US$8.2 billion). Nokia remains the largest mobile-device maker in the world with a market share of 37 percent in this year’s first quarter. However, that’s down from 39 percent in the year-ago period. Nokia expects industry sales to continue to decline this year, estimating a 10 percent overall slide from 2008. Nokia’s sales were mostly based out of the Asia Pacific, followed by Europe and then Americas. However, these bleak numbers seem to have come with silver lining as far as Nokia is concerned and while this is the worst quarter for Nokia on record, it does look like they have bottomed out and the only way from here is upwards. Considering that in Q1, 2009, Nokia’s North American numbers actually grew by 30% and was the only Nokia region to register growth, the AT&T tie up on E 71 can be a big winner. There seems to be traction on the Economy Smartphone 5800 Xpress Music, with 2.6 million units already shipped. The phone is popular in China, India and other developing countries given its price and feature attractiveness. Amongst other strong signs of recovery is the fact that it has retained its 37% market share, and has in fact gained in strength in China and India, whereby Motorola and Sony Ericsson are flopping out. Nokia’s impressive offensive at the low end will make sure that market shares are stable and increasing for sometime. 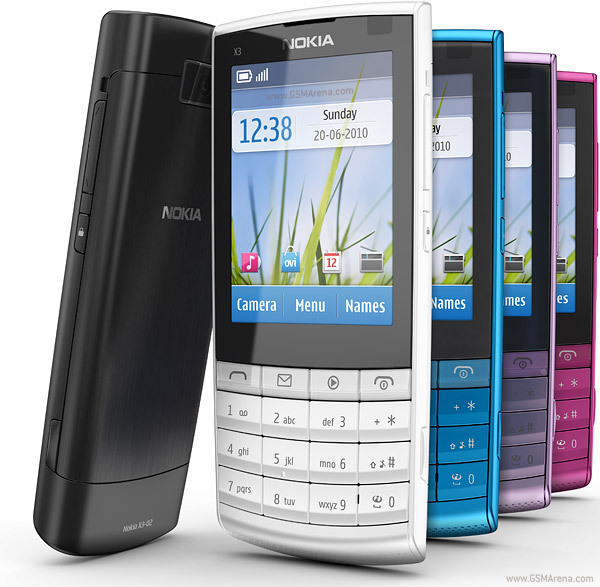 With N97 Nokia looks to get back at the technology leaders platform, a mantle it has lost to Apple and RIM in the recent times. Nokia expects industry mobile-device volumes in the second quarter to be at about the same level or up slightly. The company also expects its market share in the second quarter to increase. The news that sparked a Wall Street rally on Nokia’s stock was the company’s prediction that the decline in the first two quarters this year would be worse than in the second half of the year. What’s more, the company is targeting an increase in market share for the year. The two aspects, which are slight out of sync in Nokia at this time are its Netbooks foray and The flight @ Ovi, which will need to be accessed independently. The indicators at this point of time may not favour Nokia, but it certainly looks like Future Bright for Nokia. Ovi is Nokia’s door (Literally in Finnish) to the high end internet and convergence enabled consumers. Over a year and a half, Nokia has been building its Ovi brand. On 16th February, 2009, Nokia announced Ovi Application store, a virtual store front where developers can develop applications and consumers can easily download them. N 97 will be the first device to sport the Ovi Aps store when it goes to sale in June 2009! The Store will be available on its S40 and S 60 platform devices. Nokia intends to pep up the offering by tracking downloads and suggesting applications to users, which may be of their interest. Apple and Google are “there”, Nokia, RIM, Palm will get there soon. Microsoft is also designing something on these lines. While Ovi Apps Store (OAS) has the advantage of a captive base of Nokia’s consumers, which it can choose to exploit well, there are some formidable challenges that OAS faces. The first challenge obviously is a “me too” positioning important from a perspective of “being available” to its consumers. Having the store was not really a innovation novelty as much as having a store to offer 3rd party applications. iPhone and Google have established themselves fairly well in the application space and the next three entries will be (RIM, Nokia, Pearl) will only fragment the market to feed their consumers! The happening place in terms of application and their developments is really the North American market and Nokia doesnot have a good representation out there. This is slightly stiffling as Android and iPhone are getting ahead in the same context. Nokia can tap into the base of developers in Europe and South East Asia. However, the market for applications and downloading is not so great in South Asia. Thus, cutting edge applications can have longer acceptance periods. One significant advantage that Nokia brings to the table is the robustness and stability of its Symbian platform. There is a lot of work that is happening on Android and Microsoft platforms. While Microsoft is distinctly seen as “pro enterprise”, Android is seen as “pro consumer”. Apple is .. “apple”. Symbian has not generated as much interest in terms of work lately as a Android or a iPhone has. Nokia already has a the largest community of developers (3.5 million). So there will not be any dearth of Ideas! However, with low acceptance of applications in Nokia dominated markets, the same application developers may get higher returns in the Android, Microsoft or iPhone stores. The first 6 months after launch is going to be important for Ovi. This is because, there will be a lot of applications, which will be source copied from the Apple store and Android store. The developers will expect a quick buck. Making a fast buck will depend on the ability of Ovi and the consumer acceptance of the Symbian store. That may shape the developer perception of the Ovi store! Microsoft, Google and Ovi: The Error list! Less than 2 days back, i had blogged about the fallibilities of the super corportaions: Microsoft and Google. http://technologyandtelecom.blogspot.com/2009/02/even-invincible-and-infallible.html. Interestingly enough Nokia’s foray into online services and application, Ovi has fallen into the list of goofers! This happened when a recent server crash lost all unsynched data on Ovi. This unsynched data is dated from January 23rd 2009 to Febrauary 9th, 2009. This means any data uploaded by the consumer from 23rd Janaury 2009 onwards would not have been saved. Ovi is Nokia’s foray into internet services through the Nokia devices. Apart From Nokia’s Ovi, Apple’s Mobileme and Microsoft’s My Phone service (to debut) use the cloud to store data uploaded by the customer! While the number of affected users is limited, because of Ovi’s small userbase, it is worth questioning what would happen if for some reason a Facebook would have such a failure. The conclusion here for the user is: Dont trust the cloud for everything. It is also wise to have a back up local hard disk for your data.